Good oral hygiene removes bacteria and the food particles that combine to create cavities. For infants, use a wet gauze or clean washcloth to wipe the plaque from teeth and gums. Avoid putting your child to bed with a bottle filled with anything other than water. For older children, brush their teeth at least twice a day. Watch the number of snacks containing sugar that you give your children and also reduce the amount of drinks like juice boxes, sodas, and energy drinks. Your pediatric dentist may also recommend protective sealants or prescription fluoride toothpaste for your child according to her/his risk caries assessment. Sealants can be applied to your child’s molars to prevent decay on hard to clean surfaces. Good oral hygiene significantly reduces your child’s risk of developing cavities. Brushing helps remove the food sources that feed the bacteria that cause cavities. 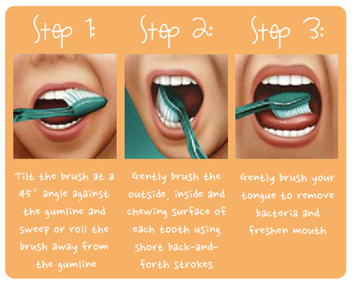 It is important to gently brush all tooth surfaces [and gums] for 2-3 minutes, using a circular motion and holding the brush so the bristles are at a 45 degree angle toward the gumline. To make sure they do a good job, help your child brush until they are at least six years old. Brush your child’s teeth after each meal or at least twice a day, especially at bedtime. It’s time to start flossing your child’s teeth once any two of them touch each other. 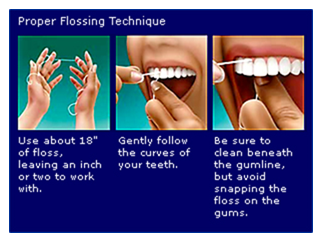 Most children are ready to begin flossing on their own at about the age of seven. We can help demonstrate proper flossing techniques. 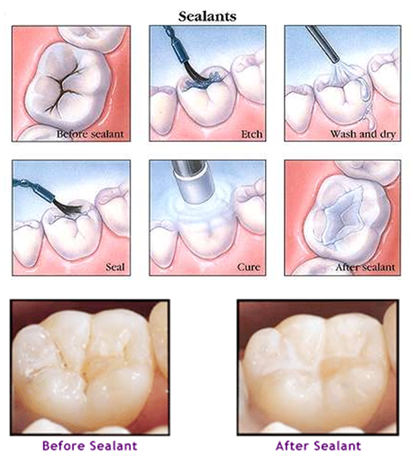 Dental sealants are a tooth colored plastic material applied to the chewing surfaces of the teeth to “seal out” plaque and food to prevent cavities. The sealant material is “painted” on the chewing surface of the back teeth and it hardens in seconds. Sealants are commonly placed on the permanent first and second molars and premolars because decay is more likely to develop on these back teeth. Fluoride helps protect teeth from decay. Fluoride treatments are given every 6 months, or as needed to restore fluoride levels, to all children under the age of 16 during their regularly scheduled exam and cleaning. At our office we use fluoride varnish. Fluoride varnish is a highly concentrated form of fluoride which is applied to the tooth's surface, by a dentist, dental hygienist or other health care professional, as a type of topical fluoride therapy. It is not a permanent varnish but due to its adherent nature it is able to stay in contact with the tooth surface for several hours. We recommend anything sticky or crunchy to avoid the removal of this varnish. Fluoride varnishes are relatively new in the United States, but they have been widely used in western Europe, Canada, and the Scandinavian countries since the 1980s as a dental caries prevention therapy.